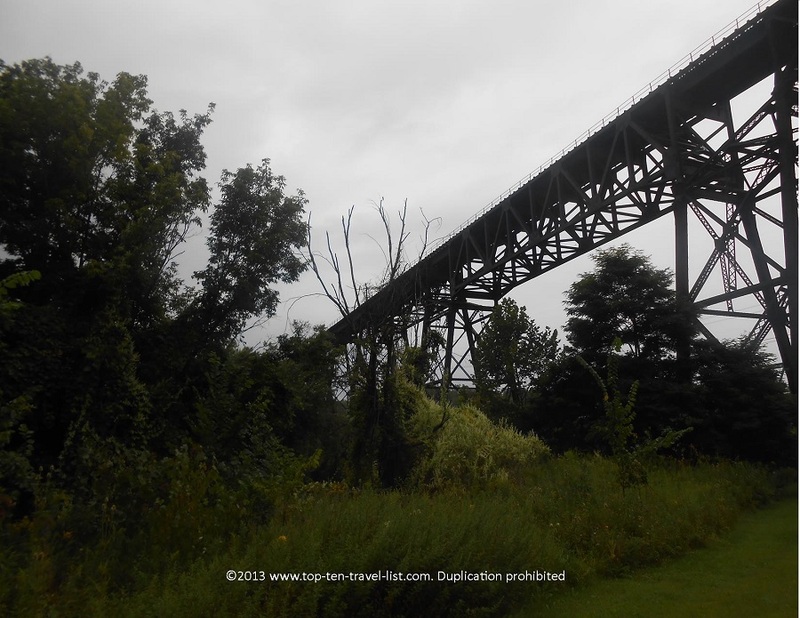 Ohio & Erie Canal Towpath Trail: Beautiful Biking in Cuyahoga County - Top Ten Travel Blog | Our experiences traveling throughout the US. 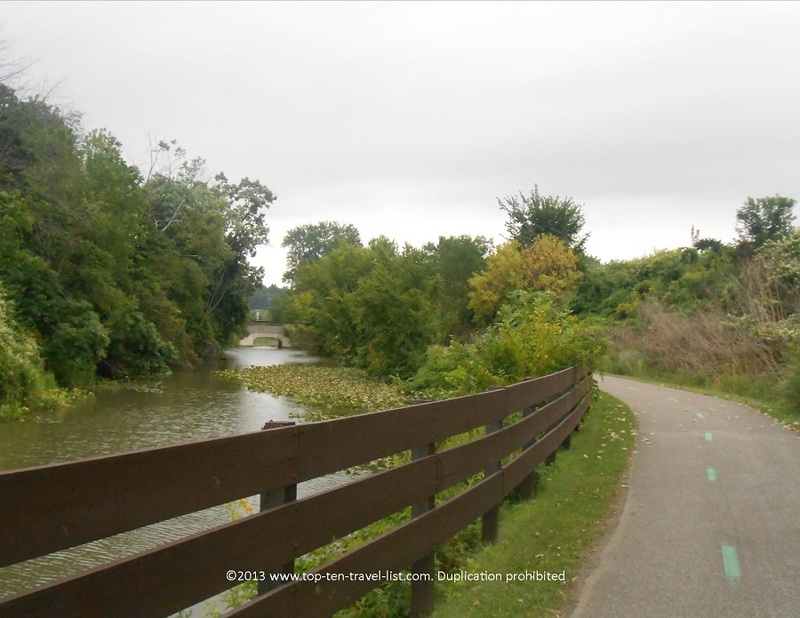 The amazing Ohio & Erie Canal Towpath stretches over 80 miles through Cuyahoga, Stark, Summit, and Tuscarawas Counties in Ohio. 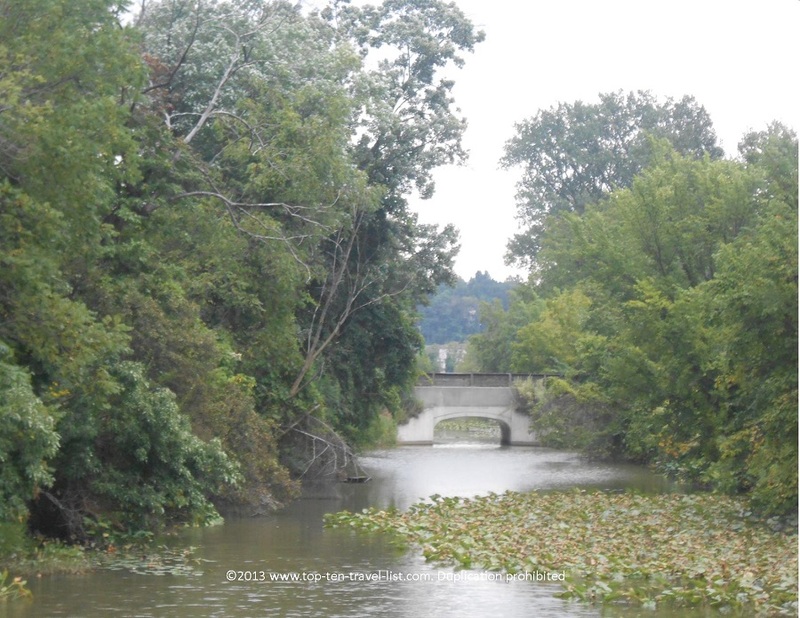 The trail follows the old Ohio & Erie Canal. 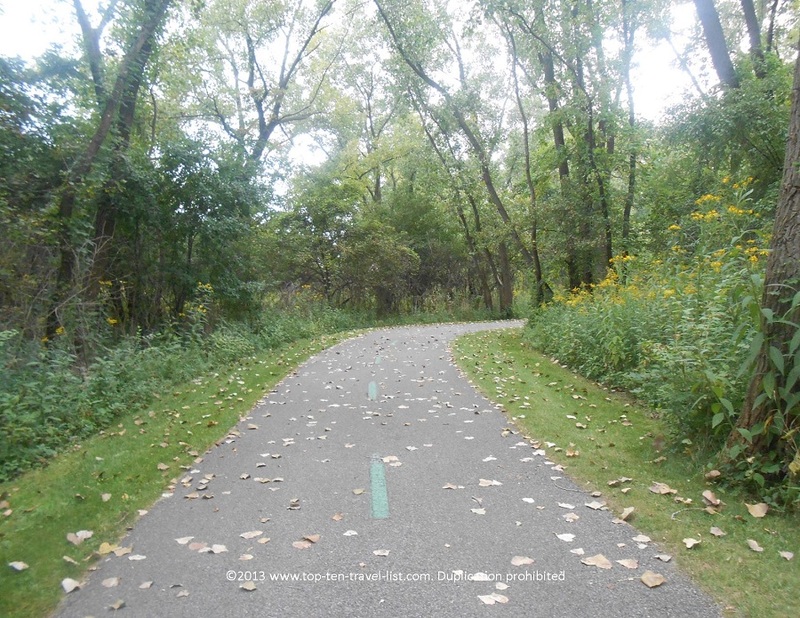 This popular biking/walking/jogging path is one of the longest in the state. When fully completed, it will run over 100 miles from Cleveland to New Philadelphia. On our trip to Cleveland, we did some researching on things to do in the area. We noticed the Towpath listed under attractions near our hotel. I knew I had seen this path on a list somewhere, so I did a search online and sure enough it was rated as one of the best in the country. Rand McNally spotlighted the path on their Best of the Road – Midwest list. We did not have time to complete a really large section of the path due to time constraints. However, we were able to fit in a decent workout: 15 miles of scenic views along the Cuyahoga County portion of the trail. The path was desolate, scenic, and flat: the perfect riding conditions! 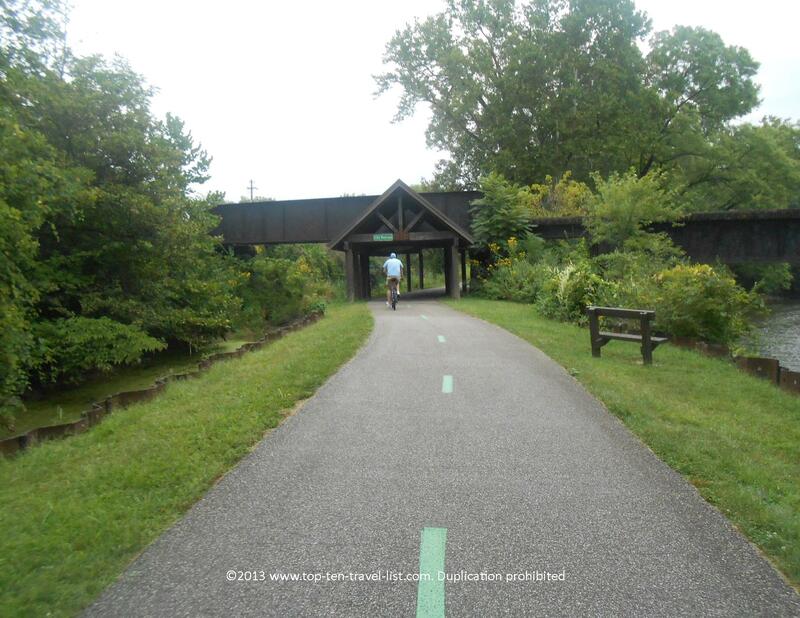 Mike and I have completed numerous bike paths throughout almost every area of the country. We really enjoyed the scenery of this path. 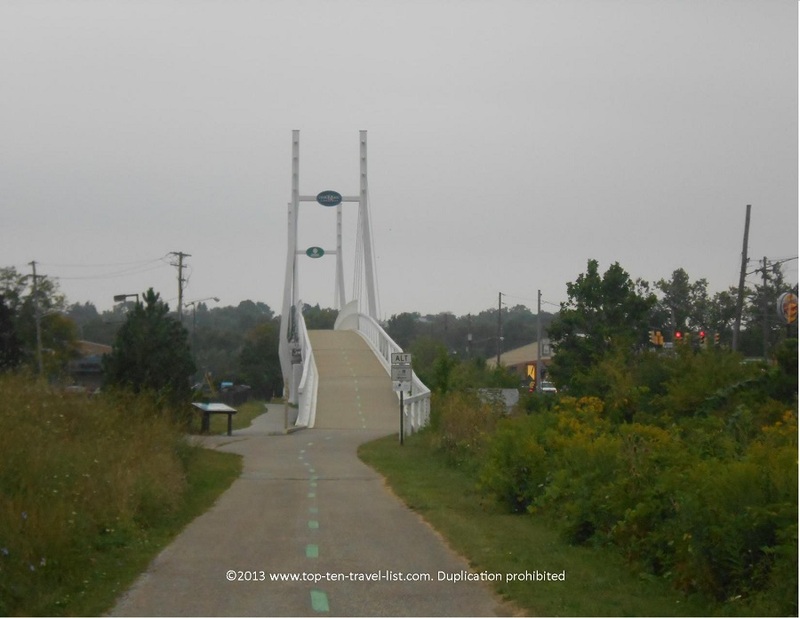 The Ohio & Erie Towpath trail was unexpectantly one of the best to date! I wasn’t expecting too much in terms of scenery considering the location in Ohio, however, I was pleasantly surprised. I imagine this path would be beautiful during the fall months, with all the leaving changing color. 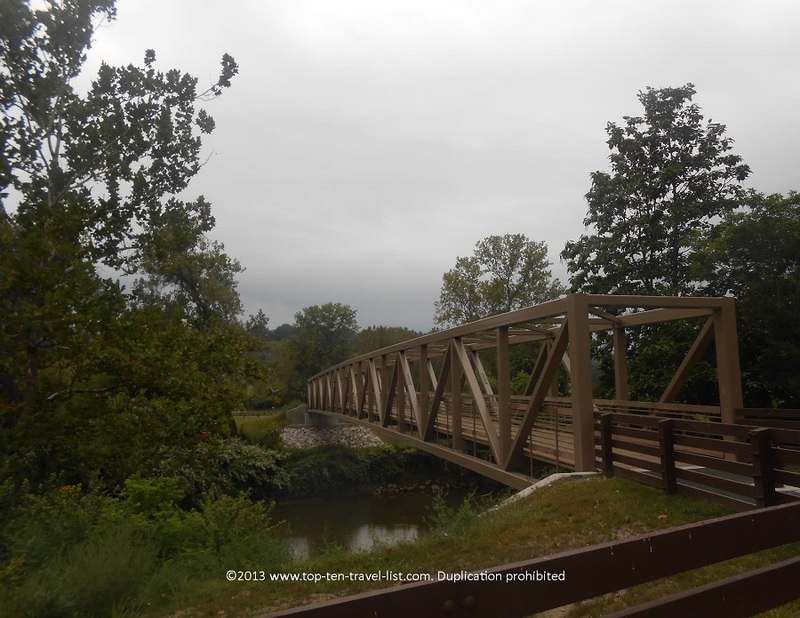 The weather was absolutely perfect – overcast, upper 60s, and drizzling. I love biking through cloudy weather as I can skip both the sunblock and sunglasses! The cooler, damp weather also leads to less dehydration and dry eyes. As an added bonus, the photographs also tend to come out better with the cloudy skies. Luckily, we finished the path (about an hour and a half) just in time before a major rainstorm hit the area! Light rain is great, however, a huge thunderstorm is not so good! There are several scenic bridges along the route for taking pictures. Check out a few of them below. Be sure to plan a break at Cuyahoga Valley National Park, which is known for its’ scenic beauty. The park was rated as one of the Top 25 places in the world for nature photography. It is also one of the Top 10 most visited national parks in the US. One of the best aspects of this path was the ease of the trail. Besides a few small hills, the Cuyahoga portion of the path was really flat and easy to ride. We had the entire path to ourselves as we only passed a handful of people the entire way. I can’t stand overly crowded bike paths which are more about swerving out of the way then enjoying the ride. 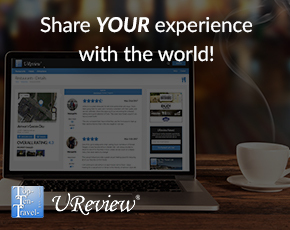 This ride allowed us to enjoy nature and the quiet, which is ideal for any bike riding trip. One unique aspect of this portion of the trail is a Bike Aboard! program. This deal allows you to bike 20 miles in one direction and then take a scenic train ride back on the return route. 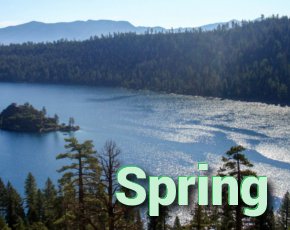 By biking, you get the scenic train ride for only $3, whereas the normal price is $18. Runners and hikers get a discounted $9 ticket. Your bike will be loaded onto the train for your convenience. You will be able to flag down the train at any of the boarding stations, so don’t feel like you have to complete the entire 20 mile section. You can take the train back at any of the stations. Check out this map of the stations. This is a fantastic deal, especially if you enjoy biking. You can in a great workout and actually get rewarded with a cheaper train ticket! Sounds great to me! I imagine this train ride would be a nice treat after several hours of biking. Relaxing and enjoying the beautiful views on your return route back to your car would be the ideal reward for your hard work. Unfortunately, this program only operates on Wednesdays-Sundays, and therefore, we were unable to take the ride. If we are ever back in the area, we are definitely taking advantage of this fantastic deal. We definitely want to plan a longer trip to Ohio to complete the entire path. Biking through this flat, scenic, and uncrowded path presented us with the perfect riding conditions. Next time, we will probably book a hotel closer to the start of the path. Our hotel was located about 15 miles a way, which was a bit of a hassle to get to with the rush hour traffic. There is a La Quinta less than a mile from the starting point, which would mean a quick bike ride over as opposed to driving through traffic and parking. Parking information: Several free large lots are located near the start of the trail. We parked at the Rockside Station lot located at 7900 Rockside Road Independence, OH. Visit the Ohio & Erie Canalway Website for more information on trailhead parking lots and mileage maps. Bike rental information: Century Cycles in Peninsula rents bicycles at their Cuyahoga Valley National Park store at the rate of $9 per hour. Visit the Century Cycles website for more information. *Bring with a camera. The trail is very scenic with plenty of photo opportunities, especially if planning for a stop at Cuyahoga Valley National Park. *Bring with enough water. I usually put a bottle in my bike holder and also carry 2 additional in a small backpack. Don’t forget a few small snacks as well. *Check the operating schedule for the train ride. If you plan on taking the scenic ride back, be aware of the limited dates and hours. It runs from April-October on Wednesdays-Sundays only. Check the full scenic train schedule for departure times. *Plan your mileage based on your fitness level. Decide in advance how much of the 80+ mileage you intend to complete so you can judge how much food/water to carry with you. Check out this mileage map to create your itinerary. 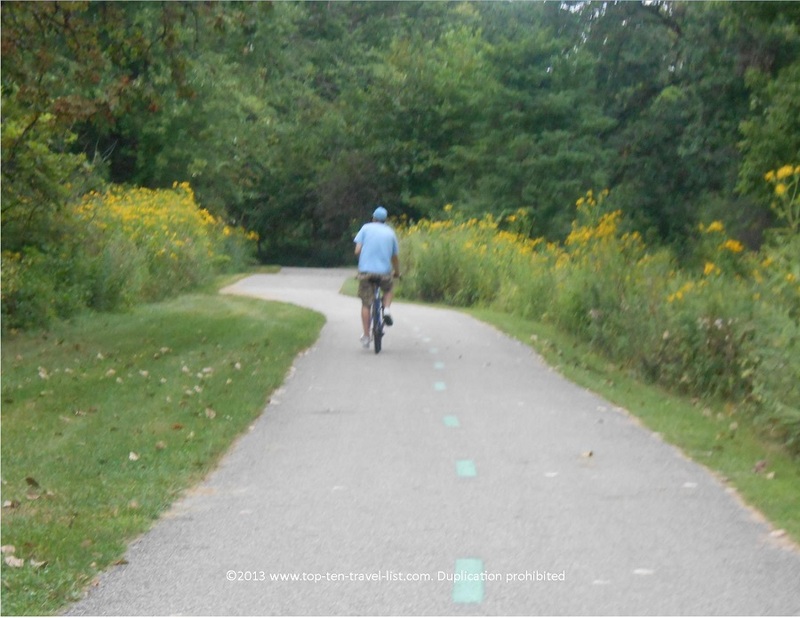 *Check the towpath alerts before scheduling a ride. You want to make sure that all sections of the path are open.